BOAT OWNER'S NOTES for 1988 BAYLINER 3818, Call Ken @ 917-696-5299. 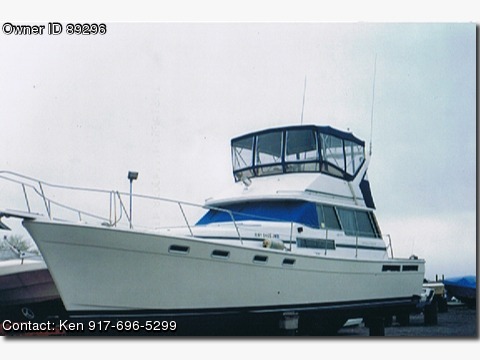 OVERVIEW: 38' Bayliner Motor Yacht, this boat is a one owner boat, This boat has given my family and I many hours of fun and pleasure, We have cruised the waters of the Atlantic, from Montauk, Long Island to Block Island, Nantauket, Martha's Vineyard and Newport. I have memories of fishing with my child in Block Island and scuba diving off wrecks in the waters of Long Island, The Frantasea never let me down, She made it through rough waters and a hurricane, she has served me well. FEATURES & EQUIPMENT: The boat is in good working condition, The interior has been redone, new upholstery and curtains. Working microwave and stove with oven and refrigerator, The interior of the boat is roomy for comfortable entertaining, The boat sleeps 6 people, very comfortably, At one point during our travels, we had 4 children and 6 adults and we were all very comfortable, The flybridge is big enough to seat 6-8 people comfortably, Flybridge enclosure is two years old, all redone, There is a Faruno radar system. POWER: Mechanically, there are 2 Hino diesel engines 175hp, the engines were tuned up, valves adjusted, elbows replaced, injectors redone, manifolds ceramic coated and cleaned, The generator is a Westerbeke 8 KW, This engine work was done by the Hino Guru, Earl Sommerfield, Bayliner owners know that Mr. Sommerfield is top notch in his field. CONCLUSION: You will enjoy many hours of pleasurable cruising, fishing, diving, whatever you choose to do, even if you just want to sit at the dock and chill, You will make many memories with the Frantasea. Questions ? : Call Ken @ 917-696-5299 .